More seeds into the beds. More wood chips in walkways. 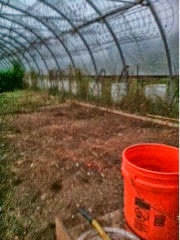 The wire rings that we use for supporting tomato plants moved from stacks on the ground to their winter location. The tomato plants grow huge and the supports need to be huge. The problem is they need to be out of the way half the year when tomato plants are out of season. Homer devised a system of home made (farm made?) hooks for hanging them from the hoophouse supports. 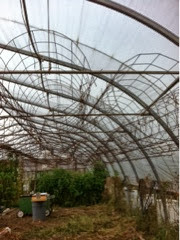 The tomato supports are out of our way, protected from wind and rain, and in place for next year. 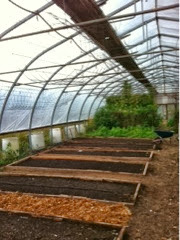 The beds beneath are being planted with winter vegetables that will be harvested until sometime next April. Space cleared and ready for more seeds. Beyond there is more clearing to do, but huge amounts of change in just two days!